It’s not every day a new Toyota Supra comes out. But we got one today at the 2018 Geneva Motor Show, and it’s looking pretty good, if a little… racecar-y. But at the presser, audiences were told that this concept was a clear signal of intent to build a real, honest-to-God Supra for the road. And let there be no doubt that it’s coming. Specs may have been leaked and speculated on, sure, but Toyota will reveal nothing other than the concept details from now on. However, that’s not a concept for a car—it’s a concept for a new type of Toyota, a fast one. A source has revealed to us that plans are afoot to make ‘GR’ cars a thing. 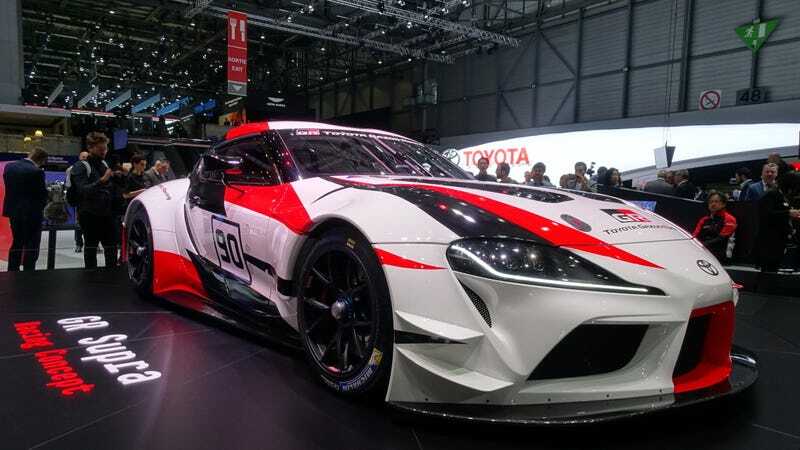 See, Gazoo Racing runs Toyota’s race car efforts, and it’s also loaned its name to a few road cars over the years (most recently a Yaris hot hatch), and now it’s got its name on the Supra Concept. If that’s not subtly creating a buzz, then what it? The whole GR thing is here to stay, and it’s likely to be Toyota’s equivalent of Audi’s RS cars, BMW’s M division and so on. When you think about it, the Supra would be the ideal halo car for the whole GR thing—it’s fast, shiny, super desirable, leans heavily on heritage so people will automatically love it, and it’ll probably be pricey enough to seem like a realistic proposition to a lot of people. However, to those who can’t quite stretch to it may like to take a look at a GR’d Yaris, or maybe a regular Auris with a GR styling pack on it. If GR’s going to be a thing it’ll be much bigger than sitting on a single car; it’ll have to be EVERYWHERE. What do we think—RS, AMG, M… GR? We’ll find out for sure soon enough. In the meantime, bask in some pics.